Yesterday was the summer solstice, which marks the longest day of the year when the sun reaches its highest point in the sky. This is an exciting and energizing time; one of my favorite parts is all of the wonderful summer fruits beginning to ripen.. like currants, gooseberries, golden raspberries, and those incredibly delicious black raspberries! Yum. This brings up an important topic that I’ve been meaning to write about: local superfoods, and more specifically local superfruits. In the health food world the term ‘superfood’ has become a common buzz phrase. More or less it is a marketing approach used by companies to promote certain products and give the impression of special and imperative health. Superfoods are various foods which possess high nutritive and phytochemical properties; they can have potent medicinal qualities or other health benefits such as associated weight loss, memory enhancement, and so on. Vegetables, herbs, and fruits can all fall into the superfood category; things like maca, blue green algae, and mangosteen. Theres always a new character in the spotlight whether its pomegranate, gojiberry, or acai…these fruits are often dried or processed into juices and sold for a premium at your local health food store. Rising consumer interest is apparent as one product containing mangosteen juice leapt from 40 million dollars in sales in 2002 to 200 million dollars in 2005. In the world of nutrition and wellness super foods are receiving all the rave, but is there anything wrong with these seemingly novel, health-providing superfoods? One thing to point out is that in most cases superfruits hail from the tropics. So, for us northerners to enjoys these high-vibe fruits, we must ship them thousands of miles VIA the industrial food transportation system. The ecological, economical, and social implications of this system are far too numerous to mention in this article. But for someone who is interested in sustainable living and holistic dietary health, this definitely doesn’t fit the toll. Some opponents claim that those scheming superfoods are more interested in profit then real health. This may be true, but there are nutrients and compounds in certain foods which have been scientifically proven to have health-boosting effects. However we mustn’t discount the old adage, ‘an apple a day keeps the doctor away’… no matter how much imported noni juice you drink. There is nothing inherently wrong in seeking foods with outstanding nutritional value, but can’t we look to local plants that grow in our bioregion? Or, perhaps plants from around the world that can at least grow in our climate? I have been entertained with the idea of local superfoods for some time now and soon enough, with the local foods movement gaining rapid momentum, so will local superfoods. Because after all its not a new idea, indigenous people have known these secrets for eons, but the meme and marketing scheme is indeed something new. No matter where you live in the world there is a high likelihood that an abundance of fruits already flourish in the wild, and there’s almost always a wide palette of fruits to choose from when giving new plants a home in your local landscape, even if you live in the coldest of climates. In some cases tapping into local super foods may simply mean harvesting them from the wild. For me, this is the case with saskatoon AKA serviceberry and red currant. In other cases it may mean introducing the plants into gardens, farms, or home landscapes. The latter of which is true in my garden with black currant and goumi. I’d like to offer an overview of just a few of the super fruits which can be grown in Michigan and other temperate climates alike. In a day and age when maintaining vital health is one of the greatest challenges, it is crucial to localize our sources of nutrition and wellness. Incorporating local superfruits into your diet is a fun and tasty way to do this. 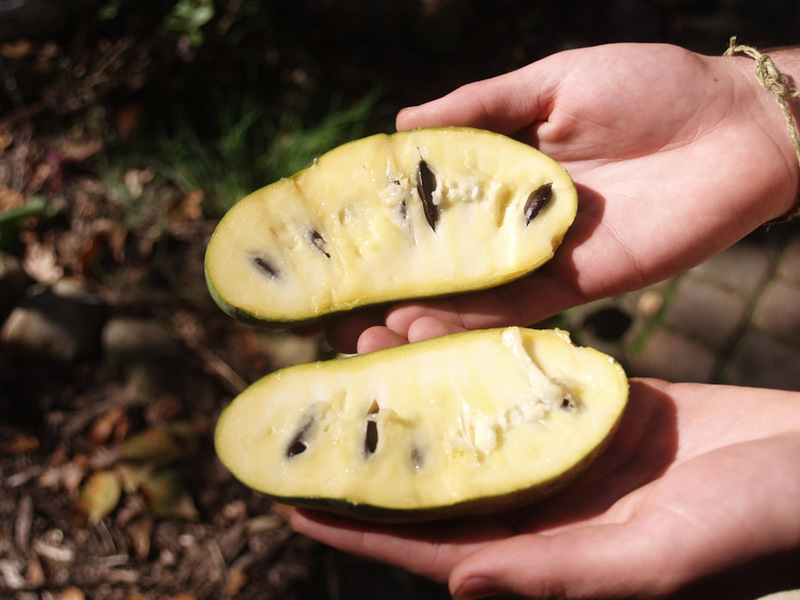 Pawpaw have a soft creamy texture and contain several lima bean-shaped inedible seeds. texture. I describe the texture as being similar to that of a mango with a very aromatic and sweet vanilla-custard flavor. A true delicacy. Nutritionally speaking pawpaws exceed apples, peaches, and grapes in vitamin, mineral, amino acid, and caloric content. Pawpaws contain all 22 essential amino acids forming a complete protein. They contain 1 ½ to 2 times the calcium as oranges, and up to 10 times that of apples and bananas . Overall mineral content far surpasses that of most common fruits. Pawpaw twigs and bark contain annonaceous acetogenins which are very powerful anti-cancer compounds being used in cancer research. Ken Asmus, longtime pawpaw enthusiast and owner of Oikos Tree Crops, claims that after eating pawpaws he gains an increased sense of awareness and feels energized. From my experience I would have to agree. Autumnberry, or more commonly ‘autumn olive’, is a medium sized shrub that acts as a pioneer species by growing in damaged and disturbed soils and improving conditions for other organisms to get a foothold. A plant which fills that tough ecological niche and produces an edible berry must have some noteworthy nutritional and medicinal qualities. Autumnberries are not only delicious but also beautiful like jewels! Autumnberries are about a ¼ inch in size and contain a single edible seed. They are particularly high in the carotenoid lycopene, which gives them their red pigment. They can contain 17-80x more lycopene than found in a tomato! Currently tomatoes are the main source of lycopene in the American diet. Lycopene has powerful antioxidant properties and is being used in medical research. One article on prostate cancer research notes: ”The berries also contain high levels of vitamins A, C and E, and flavonoids and essential fatty acids.”. The flavonoid content of certain plants has always been an important component of eastern medicine and is now catching on in the west. Autumnberry’s complex make-up of beneficial compounds has drawn attention to the medical community and it is now being looked into for the treatment of cancer and heart disease. Conservationists frame autumnberry as being a noxious invasive and have eradication efforts underway. Others are looking to the plant and asking ‘how can we have a beneficial relationship’? The discussion of invasion biology is highly controversial and political especially since companies like Monsanto have gotten involved. BUT, I say instead of injecting toxic herbicides into already highly disturbed ecosystems, lets harvest the berries, turn them into jams, jellies, fruit leathers, and medicine! Furthermore we could chop-n-drop the plants and utilize their incredible nitrogen fixing abilities to improve degraded soils. We’ll save that for another post, though! Click here to learn more about autumnberry research. Aronia berries grow in dense clusters making harvesting quick and conveniant. fruits. 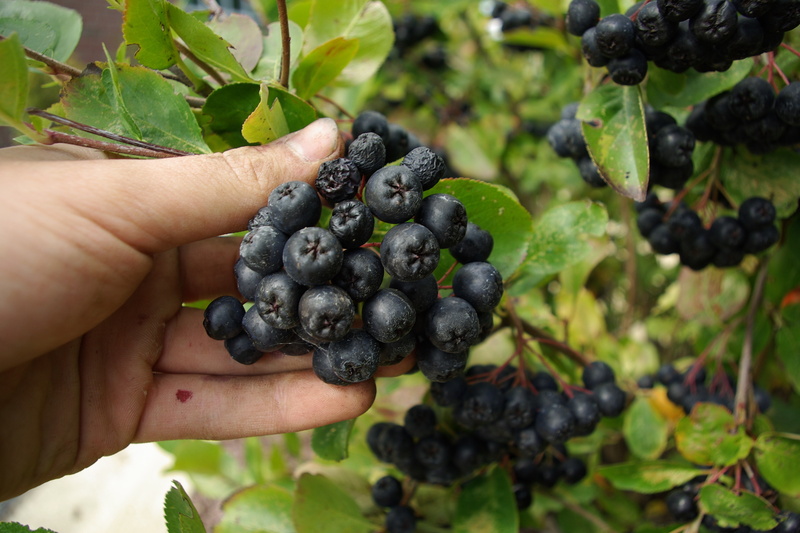 Now aronia is making a resurgence due to its unusual nutraceutical profile. The berries are one of the richest plant sources of beneficial phenolic substances, particularly anthocyanins– which account for the dark blue pigment. 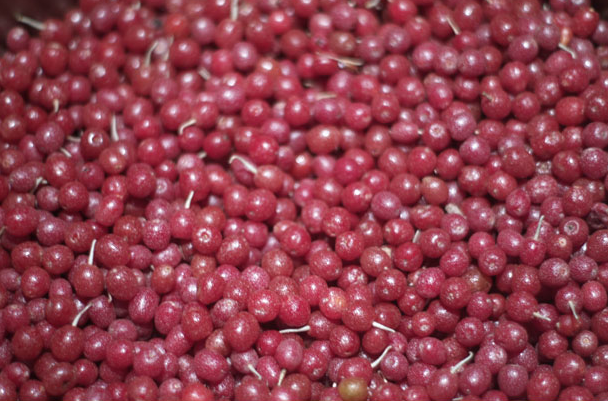 They contain several times the anthocyanin concentration compared to cranberries . Antioxidants found in aronia berries prevent the build up of free radicals and are being used widely in the treatment and reduction of cardiovascular risk factors. Aronia extracts, concentrates, and juices are becoming available on the market. My favorite way to consume the berries is after they’ve either froze on the bush in late fall/early winter, or after they’ve been in my freezer for a while. This reduces the astringency slightly and makes them a bit more palatable. They are delicious fresh, too…especially if you like sharp flavors. I also add the frozen berries to my smoothies. Aside from aronias potent medicinal effects the berries are also high in vitamin C, vitamin E, and folic acid. With all foods, care must be taken in not overcooking the fruits as the nutritive qualities can diminish under high heat. I was told a story about an event at Oikos Tree Crops where aronia juice was available for the participants; one individual took a special liking and drank a few cups(maybe too much!? ), and supposedly it had a caffeine-like effect on her. One of the great things about aronia is that they can be found growing in the wild or as landscape specimens; in fact I harvested several pounds from a planting at a local grocery store! These are just a few of the superfruits that can be grown or harvested in Michigan. It is important to note that there isn’t one fix all fruit. All fruits contain different substances and have their own unique benefits. Eating a wide diversity of different fruits and berries is a good approach for sustaining maximum health. If you’re interested in the idea of popularizing local superfoods or want to learn more about those described in this article then please contact me. Happy harvesting!!! 1. Schardt, David (November 2006). "Super Fruit: Squeezing cold cash out of three 'hot' juices". Nutrition Action Healthletter (Center for Science in the Public Interest): 9–11. Retrieved 23 June 2009. 2. "Pawpaw Description and Nutritional Information." Cooking with Pawpaws. N.p., n.d. Web. 20 June 2012. <http://www.pawpaw.kysu.edu/pawpaw/cooking.htm>. 3. Aronia Berries Health Benefit by Ray Sahelian, M.D." Aronia Berries Health Benefit by Ray Sahelian, M.D. N.p., n.d. Web. 21 June 201<http://www.raysahelian.com/aronia.html>.